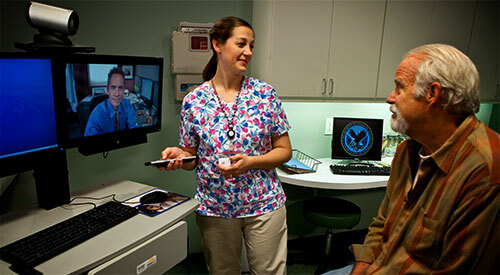 For more than 25 years, we have had a telemedicine program with the Ohio Department of Corrections. Inmates with medical conditions requiring more than basic primary care go to a video camera set up in the infirmary of Ohio prisons where there is 2-way video communication with a specialist at the Ohio State University Wexner Medical Center. There is a nurse at the prison-end who can do physical examination directed by the physician at the OSU-end and there is an electronic stethoscope for auscultation. Why it works: It is cost effective for the Department of Corrections. It costs a lot to transport an inmate across the state to be seen by a physician in person and there is security risks. It is far cheaper for the Department of Corrections to pay our medical center for telemedicine visits. Patients that do need in-hospital care for medical or surgical conditions are admitted to a locked-down prison unit at University Hospital. Patients who come into the emergency department at University Hospital East are evaluated by a two-way video camera system by a psychiatrist located in a remote location. The psychiatrist can determine if the patient needs inpatient hospitalization in a psychiatric hospital or if they can be safely discharged from the ER. Why it works: Our psychiatrists are based out of the main University Hospital campus where the inpatient psychiatry hospital is. My hospital, University Hospital East, is 9 miles away. A psychiatrist seeing emergency department and psychiatric observation patients would need to leave those patients and drive over to our hospital to see psychiatry patients in the emergency department. Telepsychiatry permits the psychiatrist to evaluate patients remotely, thus keeping the number of patients being boarded in the emergency department for psychiatric evaluation down. Patients presenting to the emergency department with an acute stroke get a quick screening head CT and then a stroke neurologist (a neurologist who has done an advanced fellowship in stroke medicine) evaluates the patient by a video system. The stroke neurologist then makes a decision about whether the patient should receive t-PA (a blood clot dissolving medication). 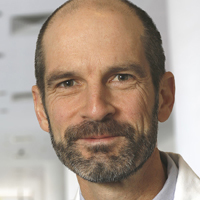 Why it works: From the time a patient with an acute stroke arrives in the emergency department, we only have an hour for the emergency department physician to do his/her assessment, get a head CT to be sure that there is not a tumor or bleeding in the brain, be assessed by the stroke neurologist, and then get the t-PA. If you go much beyond an hour, the stroke becomes irreversible. There are not enough stroke neurologists to have one in every emergency department 24-hours a day so the solution is to have a central “hub” (our main University Hospital) and then a few dozen “spoke” hospitals that can use telemedicine to connect to the stroke neurologist at the hub. My hospital, University Hospital East, is one of many spoke hospitals affiliated with Ohio State. Hospitalist at University Hospital East can take a photo of a rash or skin lesion and load it into our electronic medical record. A dermatologist at a remote location can then look at the photo and determine if there is enough information to make a diagnosis, if a punch or shave biopsy of the skin is required (which can be done by our family physicians or general internists), or if an in-person consult is required. Why it works: We don’t have a lot of dermatology consults in our hospital. The cost of a dermatologist driving 15-20 minutes each way to come to our hospital to see a consult is not cost effective – they can see a lot of patients in the office in that 30-40 minutes. Because most of the time, the dermatologist can make a reasonably confident diagnosis from the photograph, it allows the dermatologist to see more patients rather than wasting time in the car. We have also extended the teledermatology program to Ohio State primary care physicians who can take a photo of a rash using their smartphone, load that image into the electronic medical record, and then the dermatologist will give an opinion within 24 hours – far simpler than waiting 2 weeks for a new patient appointment; the medical center is currently funding this program since it is not covered by private insurance. This one is a natural product of the computerization of radiology images. A radiologist can pull up an x-ray or CT scan from any computer, anywhere in the world, and read the radiology study. Why it works: The images on the computer are every bit as good (and usually better) than the images on old-fashioned x-ray films. We have x-ray sites all over the city and this allows the radiologist to be in one location and give an immediate interpretation of an x-ray done at any of these sites and report them on our electronic medical record. At University Hospital East, we have a general pathologist on site. But sometimes, you need a pathology specialist to review and interpret the microscope slides of a biopsy. Also, we have a procedure called “endobronchial ultrasound” where a needle aspirate of a suspicious lymph node or lung mass is taken during a bronchoscopy using a tiny ultrasound at the tip of the bronchoscope to guide the needle to the right place. Normally, there a cytopathologist (a pathologist who specializes in looking at cytology slides) does an immediate stain of the cells removed from each pass of the needle to tell the bronchoscopist whether there is enough cells to make a cancer diagnosis or whether additional passes of the needle are required. In telepathology, the microscope slide is loaded into a special microscope that can be manipulated by a pathologist viewing the images from that microscope over the internet, miles away. Why it works: The cytopathologist can be at one location and review slides being done simultaneously from multiple other locations without having to travel to multiple sites in a single hospital or to multiple hospitals within a hospital system. Also, if a surgical procedure runs late, an on-call pathologist at one hospital location can do a frozen section analysis of a specimen at a different location so that a second pathologist does not need to be called in to do the frozen section. In the past, telemedicine has always been constrained by reimbursement: Medicare and insurance companies did not want to pay for something seen as less than a “real” face-to-face encounter. But there are other economic factors in play – it is too costly for hospitals to have a stroke neurologist, psychiatrist, cytopathologist, dermatologist, or radiologist physically located at all sites within a large medical center at the same time. So even though many of the telemedicine services mentioned in this post are not reimbursable, they are financially viable because they obviate the need for a high-cost specialist to have a lot of down time driving from one location to another. If we move toward a capitated health care model, we will likely see telemedicine incorporated into other practices. Just imagine how happy patients would be to get a ring on their Skype program when their doctor is ready to see them, rather than having to drive to their doctor’s office, park, wait in the waiting room, and then wait again in the examination room to finally see the doctor who is (as all doctors always seem to be) running late. The only thing holding us back is economics.